How about this carrier concept ? Carriers here dont have any heavy weapons , only secundaries . But, it can launch wings of scouts , fighters , bombers and torpedo bombers (4 squads with 3-5 planes of any type at same time). Scouts have no weapons but have large area of detecting enemy. Fighters auto attack any planes in area they are told to be. Bombers auto attack target you mark them ,by just flying to target and droping bombs/torpedos as soon target is in range, and then return to rearm . They are easily killed ,but in large numbers some of them will alwais slip by and do some damage .Planes in that games are expendable, and same shuld done in Disco , to Carrier planes , they shuld be very weak , with strong weapons , die easily but they do some serius damage in large numbers if oponent fail to stop mayority of planes to reach its target . Carrier in that game have 8 scouts, 15 fighters and 24 bombers of each type , but can only launch 3-5 in one wing, once all his planes are killed , carrier is helpless. Carriers here dont rush in to combat, but stay at edge of battle and support , but once enemy Destroyers (extrimly fast and can easy catch up with Carrier and who can easyly dodge bombers attack and also easyly shooth them down) encircled me , i was toast and easily killed . Carriers kill Battleships , Cruisers and enemy planes-Battleships kill Cruisers and Destroyes-Cruisers kill Destroyes-Destoyers kill Submarines and enemy planes-and Sumbarines kills Carriers and Battleships. This concept is proven, it work , in that game anyway. Now, since we also have Scisiors-paper-rock system here in disco, it just need little imagination for this carrier system be modified to needs of disco . For example, lets say we make carries that can launch snubs and bombers , carrier can decide to send all bombers to attack enemy capital, which leaves them easy target to enemy carrier snubs or player in snub . Or , he can launch half of planes as fighters to ocupie enemy player in snub , while he send rest as bombers to attack capital while player in snub is ocupied . Since carrier wings easily die , player in snub will win eventualy , but bombers can do a lot of damage in meantime , or if he decide to kill bombers , carrier fighters who do die easy, but have strong weapons , can kill him . The issue is, as it has been pointed out by Devs, that deployment of more than one drone is hardly possible due to technical reasons. So the concept of over 5 deployable snubs is off the board. As for the support ships - there is rarely an opportunity to support, to be honest. Most of the time carriers fly alone and are useless. Why not simply replace carriers with battleships? Makes all our jobs easier and the game more fun. Where is the fun in watching the drone do everything while chilling out of range? (11-07-2018, 01:11 AM)Thunderer Wrote: Why not simply replace carriers with battleships? Makes all our jobs easier and the game more fun. Where is the fun in watching the drone do everything while chilling out of range? It’s only fun when its doing everything to you. I am always target number 1. 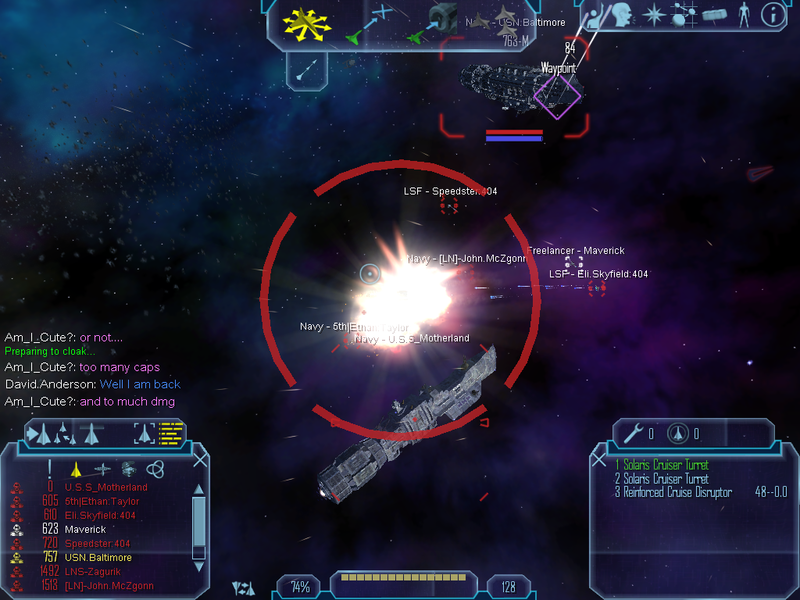 Stopped flying battleships and started flying battlecruisers, they are harder to shoot at. Give carriers an AoE version of the repair tool that repair ships have: Heals all allied ships in a 1k range around the carrier, at a heavy power cost. Make the power drain moderate enough that the carrier cant effectively fight and heal fighters at the same time, so it has to pick between one or the other. Make the repair amount large/fast enough to only be viable for restoring snubcraft and maybe freighters/gunboats to a degree, while taking much longer to repair larger ships so they cant be used like giant battleship nanobots. (11-07-2018, 01:44 AM)Tenacity Wrote: Give carriers an AoE version of the repair tool that repair ships have: Heals all allied ships in a 1k range around the carrier, at a heavy power cost. Tbh, that would be a boring gameplay. Partly, because yet again big fleets amass quite rarely. Partly, because it just will be targeted first and will be dead quite soon. The suggestion indeed targets the role of a carrier irl, but in disco that would be very boring and useless for the sake of missions and flying alone for RP. I've been for this for ages... Cos even I knew such an entity to work in game would be a nightmare. ngl tho I miss seeing those things with 6 prims.